Note Sky on the Xbox 360 console is available in the United Kingdom and the Republic of Ireland only. Learn about registering with Sky at www.skyplayer.com/xbox. Browse or search for Sky. Select the Sky app, and then select Download and then Confirm Purchase to download and install the app. To start Sky later, go to apps, My Apps, and then Sky. Note If you don't have a Sky subscription, you are directed to the Sky website to sign up. Learn more about Sky programming, billing, and account setup at xbox.skyplayer.com/help. Go to app, My Apps, and then Sky. Sign in: After you sign in using your Sky iD, you will not be prompted to do so again unless you deactivate the console from your account. Have a look around: You can browse the content offered within the app without signing in. However, you have to sign in to view any content. Select Got a Sky iD? Sign in. 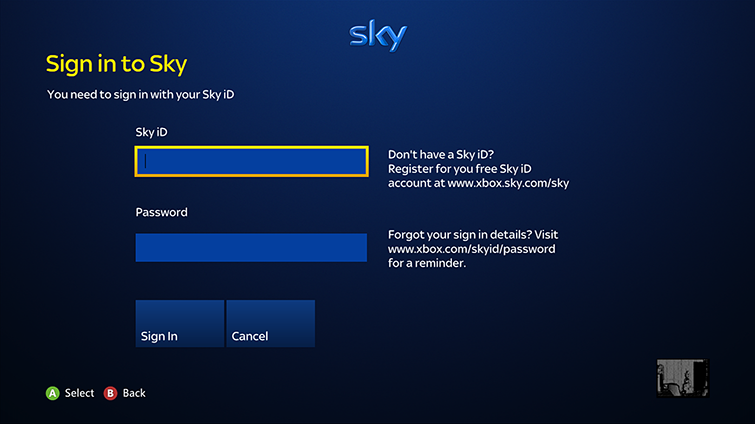 Use your Sky iD credentials to sign in. From the TV Guide hub, you can select a channel to watch and view live TV. 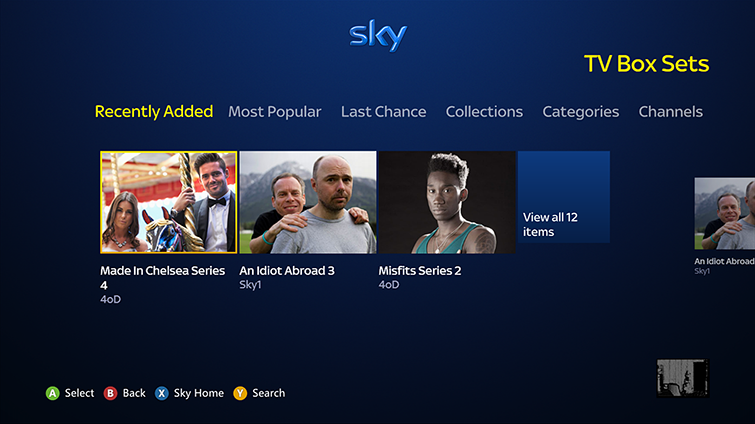 You can use the Sky app to watch a variety of sports, films and entertainment channels from Sky, dependent on your subscription. Whilst watching live TV, press A to see Now and Next information for the current channel and press Y to see information about the programme that is currently on. Press B to close this information. Use the directional pad or the left thumbstick to see what is on the other channels, and then press A to change to that channel. You can also change channels by pressing the left bumper (LB) and right bumper (RB). Note For best results, you will need an effective broadband speed of 2 Mbps. Catch Up has the latest sports shows and series form the Sky channels that you subscribe to. TV Box Sets has older series and programmes, as well as content from other channels. 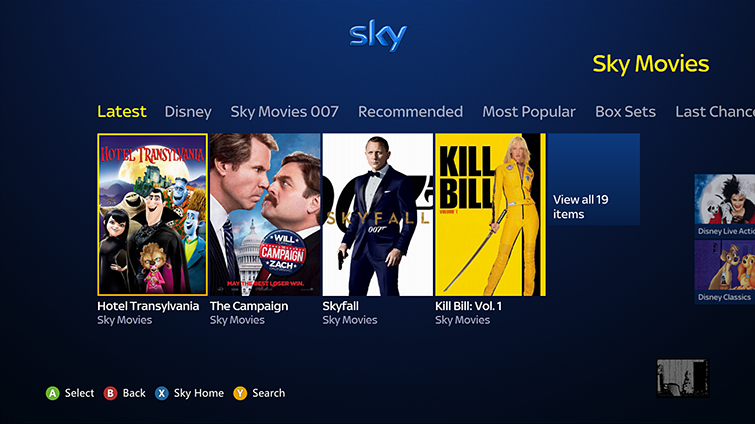 Sky Movies has films from the Sky Movies channels. From the Search hub, you can search for content based on title. Note If you set a PIN (personal identification number) on the Sky website, you might be prompted to enter the PIN when launching certain channels or on-demand content. In a web browser, go to xbox.skyplayer.com/help and sign in using your Sky ID. Select Remove Device next to the Xbox 360 console that you want to remove. 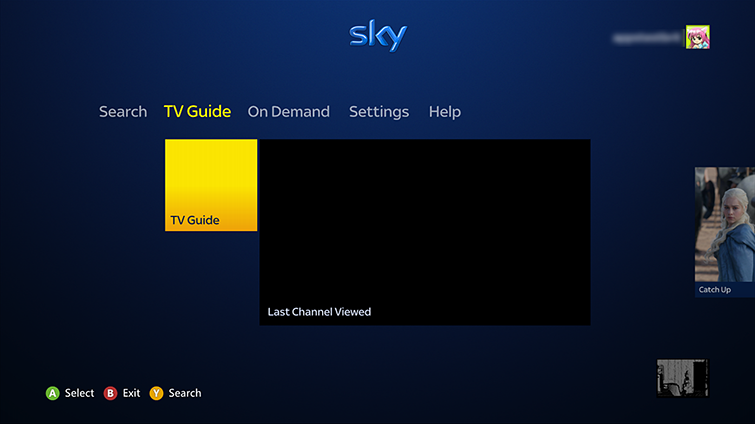 On your console, go to apps, select My Video Apps, and then select Sky. Download the Sky application. This automatically associates the new console with your Sky Go account. You can register up to two device on a single account. You can change one device per month. Only one of these devices can be an Xbox 360 console. 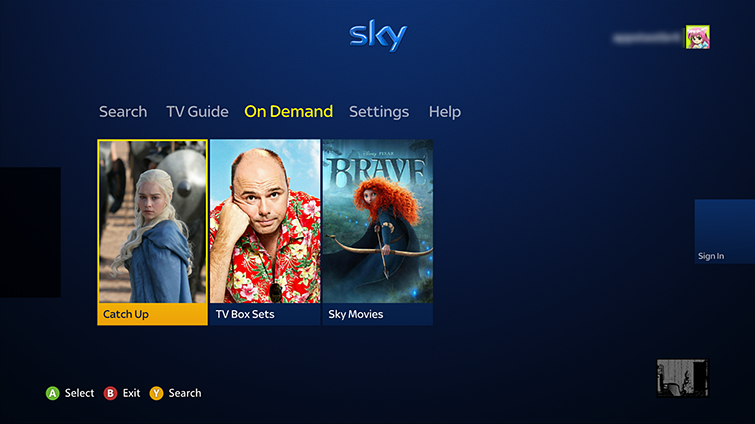 For an additional charge, you can register up to four devices by purchasing the Sky Go Extra. However, you will still only be able to register one Xbox 360 console at a time. Your Sky Go account is associated with your physical Xbox 360 console, not with your Xbox Live profile. 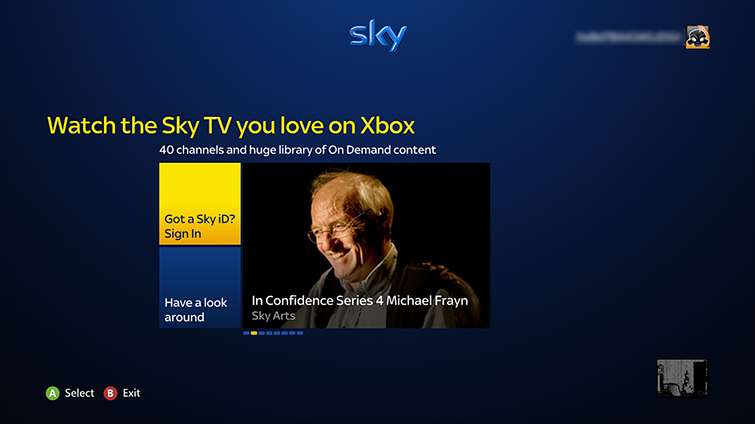 You watch Sky on your selected Xbox 360 console when you are signed in with any Xbox Live account. 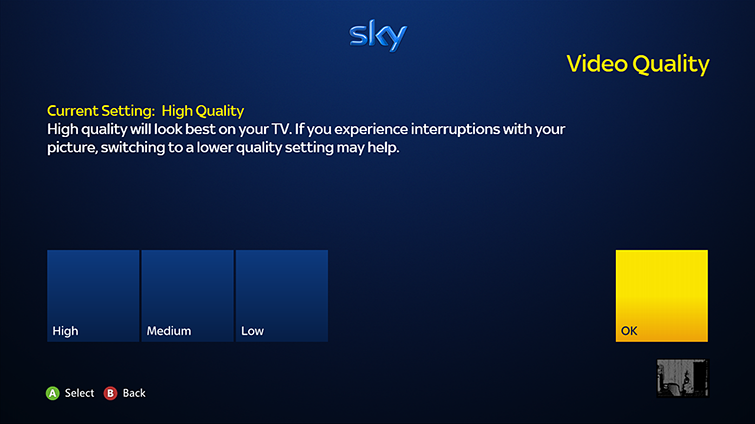 Sky Go uses its own parental control settings. You edit these on the Sky Go website. If the Xbox 360 console safety setting is set to block access to Xbox Live, then the console prompts you for the Xbox console pass code as soon as you launch the Sky application. Note Microsoft does not control Sky Go parental settings, and Xbox Support cannot help you with these settings. 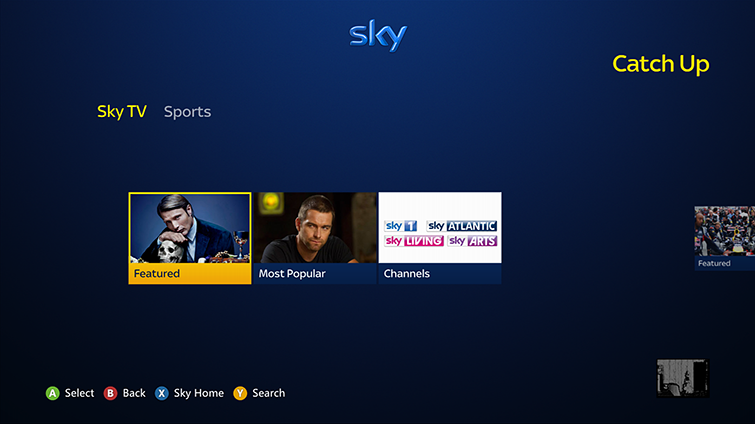 If Sky Go parental controls are not restricting content as expected, call Sky Support at 08442 411 599 or go to xbox.skyplayer.com/manage. ¿Quieres contactar con el Soporte técnico con referencia al problema "Set up and use the Sky app on Xbox 360" acerca del que estabas leyendo o con referencia a otro problema?